What on the surface seemed like a trifle turns out to be the door that leads Sherlock Holmes into a web of human trafficking, espionage, blackmail, and murder. A new and powerful cabal of master criminals has formed in London and they will stop at nothing, not even the murder of an innocent foreign student, to extend the hold on the criminal underworld of London. Uncovering their network leads Holmes and Watson into the dens of iniquity and vice, with frightful consequences for a group of innocent students and even for the love Mrs. Morton. Join Holmes and Watson as they live and work in the London of 1904. 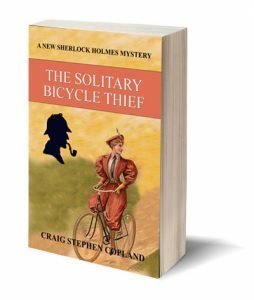 It’s a fun read and is a tribute to the original Sherlock Holmes story in the Canon. Buy or borrow, download and enjoy.